Pie week continues! Today, I made you a gluten free pie that’s so good, you won’t even notice it caters to allergy sensitive folks. Have you ever had meringue as a pie crust? It’s fabulous with chocolate cream pie. The meringue crust takes on a marshmallow flavor. When you add chocolate cream filling and whipped cream on top, you win the who-brought-the-best-pie-to-Thanksgiving contest. You did it! This chocolate cream filling recipe is unusual in the fact that it does not contain milk. I’ve always made chocolate cream filling (chocolate pudding, essentially) with milk. Then, I made Kathleen King’s Chocolate Cupcakes with Pudding Frosting and discovered her amazing chocolate pudding recipe made without milk. I love its dark color and intense chocolate flavor. This recipe makes 6 two-bite pies, but it’s easily scaled up to feed a crowd. I’ve successfully doubled the recipe for a dinner party. It’s best to assemble before serving; the pudding can soften the meringue crust. I think it’s fun to line up the meringue crusts and have guests dollop on their own chocolate pudding. Put someone with a generous hand in charge squirting the whipped cream on top, and everyone is smiling and licking their fingers in no time. Chocolate just brings people together, doesn’t it? This recipe makes 6 mini 2-bite pies. First, make the pie crust: Preheat the oven to 200. In a medium bowl, add the egg white and cream of tartar. Beat with an electric mixer until foamy and soft peaks start to form. Slowly stream in 1/4 cup of the sugar while continuing to beat on medium speed. When it has stiff peaks, stop mixing. At this point, you can scrape it into a piping bag. If you're not using a piping bag, have two spoons ready. Use two spoons (or the piping bag) to make six circles of meringue on a parchment or silicone lined baking sheet. Make sure to make a divot in the middle to hold the chocolate filling later. Bake for 45 minutes, and then turn off oven and let cool another hour or so. 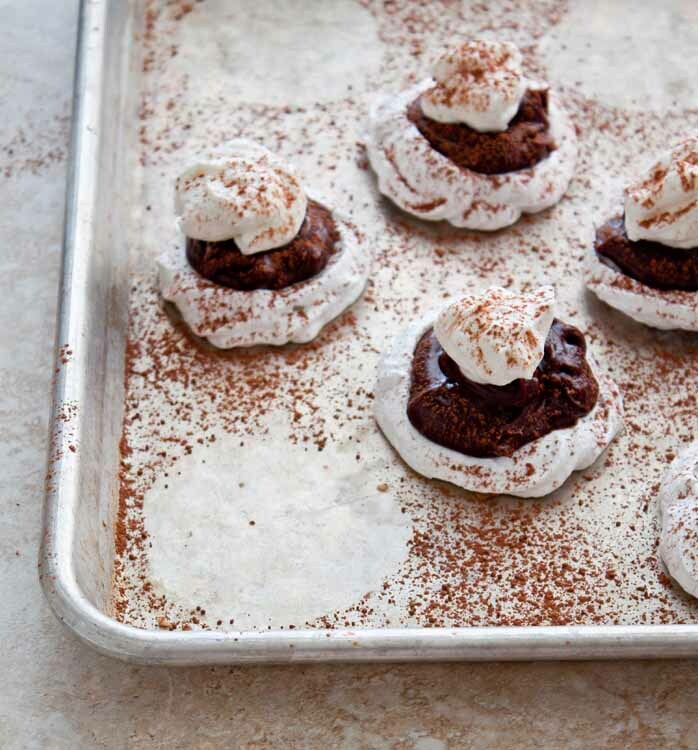 If your oven runs hot, the meringues may brown a bit---but it's totally fine. 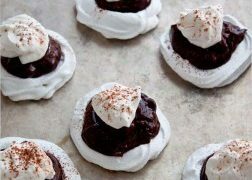 The meringues shouldn't be sticky to the touch, but they may be gooey on the inside (this is delicious). 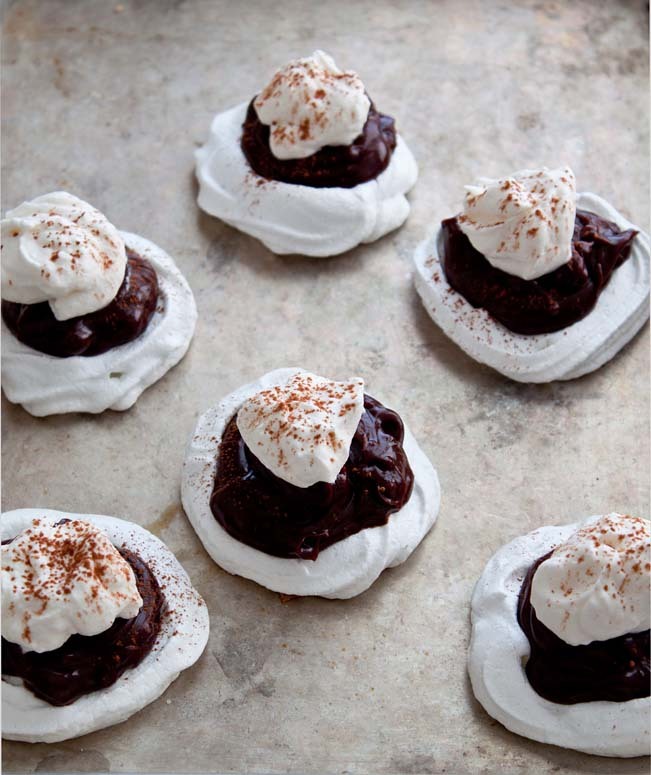 While the meringues bake, make the chocolate pudding. In a small bowl, whisk together the corn starch and 3 tablespoons of the water. Whisk very well vigorously to avoid lumps. Next, add the remaining water, sugar, cocoa powder and corn syrup into a small saucepan. Whisk together well, then add the corn starch-water mixture. Turn the heat on the medium-low, and bring the mixture up to a simmer while constantly stirring. The mixture should thicken slightly, but it will thicken further later. Let it simmer for 1 minute while constantly stirring. Then, turn off the heat and stir in the butter, vanilla extract and chopped chocolate. Pour the mixture into a bowl, press plastic wrap on the surface and chill in the fridge until ready to use. Chill for a minimum of 4 hours. Before serving, make the whipped cream by beating together the heavy cream, powdered sugar and vanilla until soft peaks form. To assemble, place each meringue crust on a plate. Top each with a scoop of chocolate pudding and a generous dollop of whipped cream. Dig in. You wouldn’t even notice these were GF! I swear, after one bite all I’d be thinking is chocolate chocolate chocolate! With a side of meringue crust. Mmm. I never thought to use meringues as a base for a mini pie treat, love these! These are so beautiful and would make any GF friends out there so happy on Thanksgiving. I’ve never thought about using meringue for crust and this idea is brilliant! YUM to meringue, such a good gluten free option. I have a friend who is a coeliac who would love these! I love this idea! And, they’re just so lovely! OMIGOODNESS! I’m obsessed! Meringue as a pie crust?? YES pleeeease, esp. when that pie filling is CHOCOLATE CREAM PIIIIE ahhhhhhhh!!! I love making and eating meringues anyway, but I love the idea of using them as pie crust! I love a good crust, but for me it’s usually all about the filling anyway (well, and the ice cream on top). I think a meringue crust would be AMAZING! These are so cute, and they sound delicious! I love meringues, but I never thought to use them as pie crust! These are so fun! Love that you use the meringues as pie crusts! These are so cute and creative! I love that it makes just 6, too. I’m never feeding a huge crowd for the holidays, just 4-6, so these are perfect! Woah, meringue shells as pie crusts? I would *never* have considered it – totally genius! They’re absolutely gorgeous, and that chocolate filling sounds so wonderfully decadent. Proof again: you are a dessert wizard woman. Wear your tiara with pride! What a fun recipe. Did you say deep dark chocolate pudding? That’s right up my alley! These are so cute Christina! I’ve had pavlova before, bet these are even better! Are you sure it’s two tablespoons of cornstarch? This thickened nearly to the point of being unstirrable before it even started to simmer, and I didn’t even bother with the chopped chocolate. Still tasty though!